AnyMP4 iPod Converter is the professional converter software for iPod users, which enables you to rip DVD and convert any popular video file to iPod MP4, MOV, M4V, H.264 and MPEG-4. Apart from these converting functions, it also possesses some powerful video editing functions, thus you can edit the DVD/video effect at your disposal. In addition, with this program, you can also extract audios from any DVD/video and convert them to iPod compatible audio formats including MP3, M4A, WAV, etc. AnyMP4 iPod Converter is capable of converting DVD and any popular video such as MTS, RMVB, FLV, WMV, MP4, AVI, OGM, WTV, DVR-MS and so on to iPod MOV, MP4, M4V, H.264 and MPEG4 with fast speed. You can fully enjoy your DVD movies and video on your iPod with your friends and family. Also, it supports any version Apple devices like iPhone/iPad/iPod. 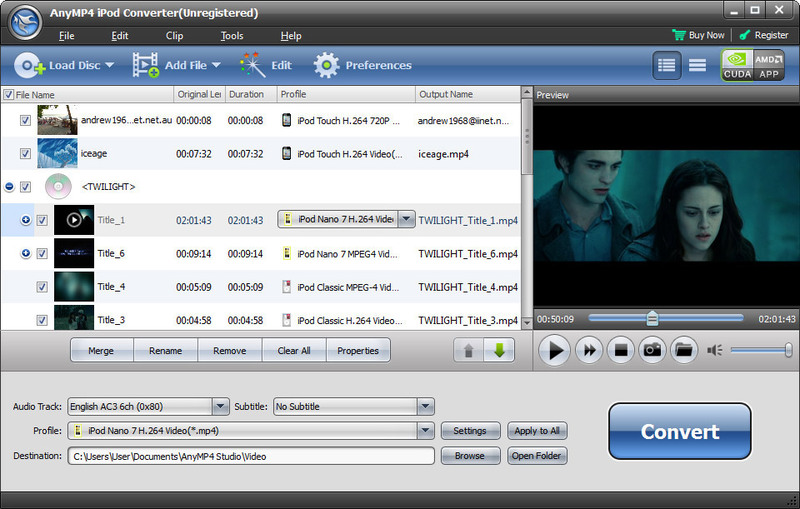 The powerful video editing functions AnyMP4 iPod Converter provides can help you edit the video at your disposal. You can trim the video to your needed length, crop the video frame, add text or picture watermark to the screen of the video, adjust the video effect by setting some parameters like brightness, saturation and contrast, Hue and Volume according to your needs. With this AnyMP4 iPod Converter, you can preview the customized video effect in the whole conversion and it allows you to capture your favorite scene and save it as an image file. Besides, if your PC is connected to the Internet, the software will automatically detect it if there are new upgrades. New upgrades will bring you better stability and more special functions.